Deep in its arctic tomb, the Thing stirs - Rhan-Tegoth. It squirms forth from its tomb, and performs the ancient rites. The Thing realizes that now is the time for the cold blasts of interstellar space to freeze the world with horror. Something far out in the start answers the call. That which walks on the wind has come to prey upon the the Earth and its inhabitants. Behold Ithaqua - the Windwalker - the latest faction expansion for your Cthulhu Wars game. Ithaqua, the god of Outer Space, is most powerful in the late game, when his mighty army, fuelled by his amazing abilities, dominate play. He is not alone, but is accompanied by a second Great Old One - the immortal Rhan-Tegoth, Herald of the Old Ones. He is also supported by the dread Gnoph-Kehs, his cannibalistic Wendigos, and his cult. Up till now, Great Cthulhu has been the most powerful faction in Battle. 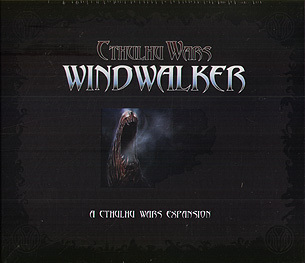 Now he has a rival - a late-game Windwalker is equal or even superior to Cthulhu's squad. Windwalker is resilient in the early game as well. His ability to hibernate lets him super-charge his turns. If you are more interested in late-game strength than early building, this is the expansion for you.